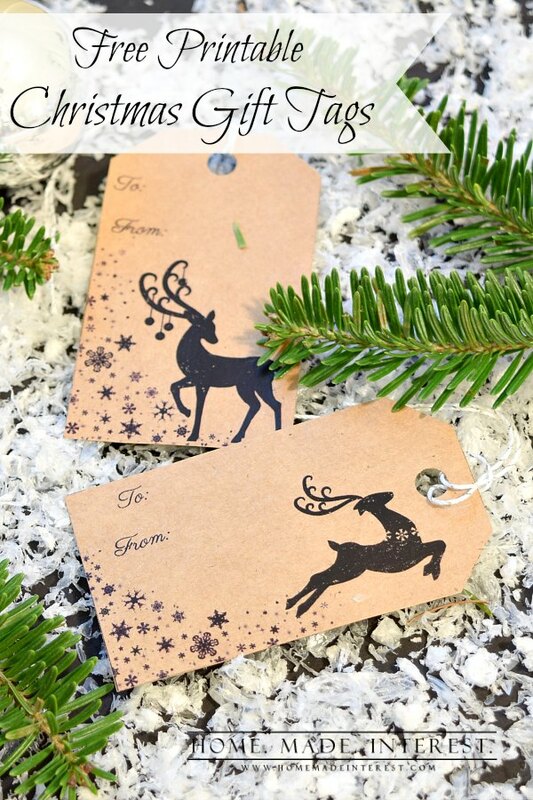 Free Printable Christmas Gift Tags - Home. Made. Interest. 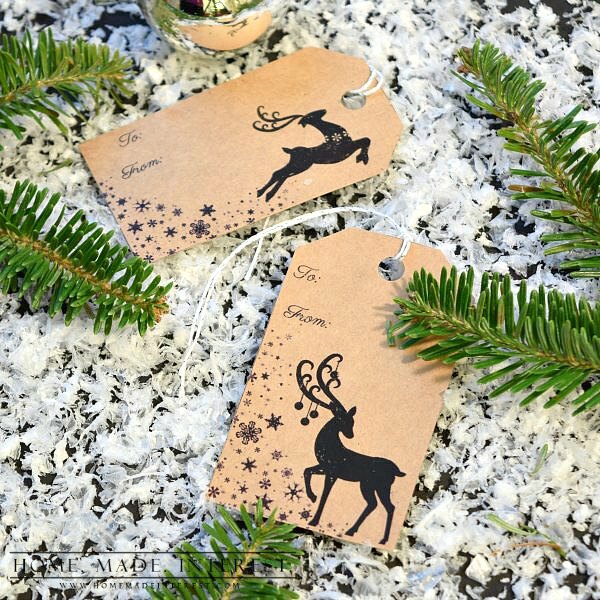 These free printable Christmas Gift Tags can be printed on scrapbook paper and cut out to add a special touch to your gifts. I always have these big dreams of wrapping all of my gifts in matching gift wrap and tying them up in gorgeous bows…and then on Christmas Eve I run down to the basement and grab whatever wrapping paper I have and wrap all of the gifts I bought. Procrastinator, that’s me. Not this year though, I AM going to get my shopping done early, and I am going to wrap everything beautifully! Really, it’s going to happen. I’m totally digging the deer trend, and I also love the look of brown paper, with gold and black accents. 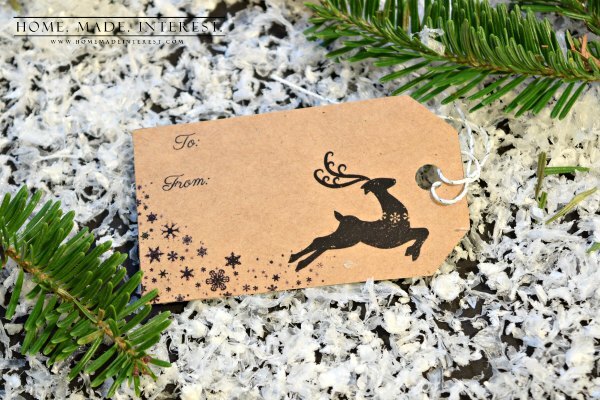 To getting my holiday gift wrapping started off on the right foot I designed a couple of printable Christmas gift tags to label my gifts with. If I can print them myself then even if I do put off wrapping until the last minute I’ll have them ready and waiting. I’m not going to procrastinate though, really. Since it is the season of giving I wanted to share them with you! I printed mine on kraft paper but you could use any colored card stock, or even white card stock if you like. Then just cut them out and punch a hole in them if you’d like to tie them to your gift, or don’t and just tape it to the top of a box. Pretty easy right? So easy I have no excuse not to get it done before Christmas Eve, lol. 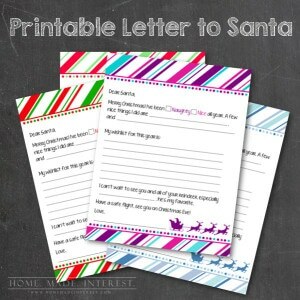 If you like those check out some of our other Christmas printables! 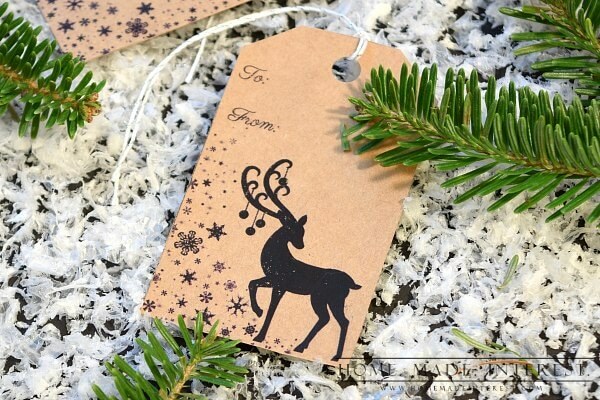 Absolutely love the kraft paper look….it’s very raw. Simple but beautiful. Love these tags! Thank you for sharing. 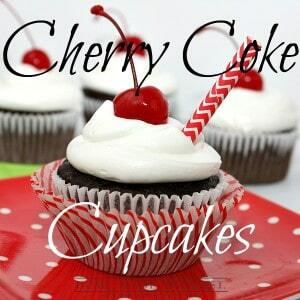 I really like the font that you used. Could you please tell me the name of it?